SFDC is a marketing powerhouse and the poster child for Software as a Service (SaaS). The company poured $376 million in aggressive advertising, marketing, sales and media in 2007. Industry leading help and online training support. A native thin-client solution designed for on-demand Internet delivery. Simple user interface that is well received by users new to online systems. Multiple industry specific or vertical market solutions – although somewhat light in terms of deep functionality. The AppExchange provides a foundation for extending the SFDC solution with deeper functionality from fee-based specialist application providers. Lots of screen refreshes and scrolling up and down; the transition between multiple screens to process transactions can deliver a tedious experience. Marketing management functionality is extremely limited. SFDC points to partner applications for this purpose. This involves additional costs and vendor management. Customization toolkits can be cumbersome to use, even to many seasoned administrators. No Service Level Agreement provided in standard contract. Data center reliability has been questioned and several major interruptions in service have been widely publicized. 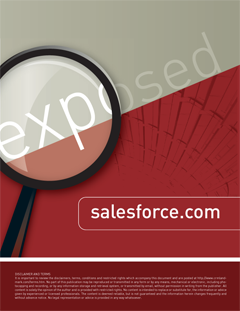 © 2009 crm-exposed.com - All rights reserved.